A spring or Summers day when the sun is out and the sky is bright blue! We are comparing Thames River Sightseeing Cruise with Afternoon Tea Prices from leading ticket suppliers and Try to find you Cheap tickets prices on the market. Afternoon tea is such a traditional British past time with small sandwiches, scones with jam and clotted cream, and teacakes served up mid-afternoon, all washed down with lashings of tea! 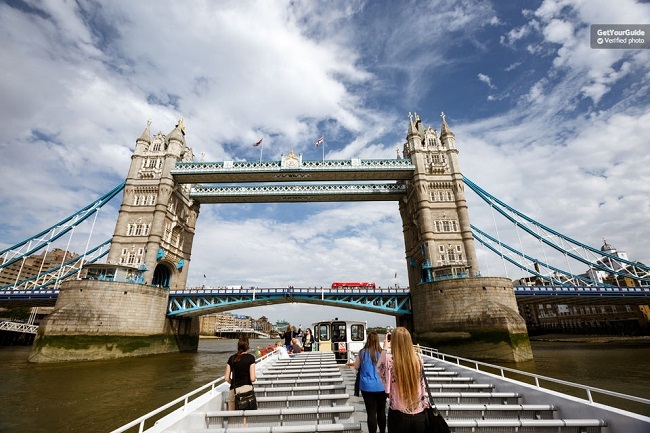 Thanks to this sightseeing cruise you no longer have to look at 4 walls whilst enjoying the past time - See London pass by as you float down the river Thames on a boat with full-length glass windows offering a panoramic view and open deck. Perfect for couples and friends who want to enjoy a sophisticated afternoon on the water whilst enjoying delicious treats. Great for travellers but also a nice way for locals to spend the afternoon. Best avoided if you have very young children. Your Experience With Thames River Sightseeing Cruise with Afternoon Tea? Board the vessel and instantly feel welcomed onboard thanks to the friendly staff who are waiting to greet you. Settle down at your table as you prepare to embark on a 90 minute cruise of the River Thames. As you're served afternoon tea you can enjoy watching Big Ben, The Shard, The London Eye, The Globe Theatre, St Paul's Cathedral, The Tower Of London, Tower Bridge and so much more pass the window. You can get up and go and stand on deck when you feel the need to stretch your legs before settling back down to devour the delicious cakes! You can purchase a glass of champagne from the onboard bar if you want to add some extra fizz to the afternoon! The round-trip cruise leaves you back at the departure pier at approximately 4.45pm having enjoyed a thoroughly sophisticated and relaxing afternoon on the water. What Thames River Sightseeing Cruise with Afternoon Tea Includes? 90 minute sightseeing Thames cruise. Book as a couple not a group - If there are 3 people sitting together there are only 2 extra sandwiches and 3 extra cakes when comparing with the platter for 2 people. Travelers Reviews about Thames River Sightseeing Cruise with Afternoon Tea? This cruise gets great reviews from travellers and locals alike, many people leaving 4 and 5 star ratings. People have described the cruise by saying it's "A very unique London experience", "A Lovely Afternoon Tea & Sightseeing" and "A Very nice boat ride - Enough food for lunch or even dinner." Most people were more than satisfied for the food and the service but some people had a bad experience, the quality not living up to their expectations. From the good reviews, most people would recommend booking this and enjoying a unique afternoon on the river Thames. Boarding time is generally 15 minutes before departure - Check your confirmation email for exact timings. Embankment Pier or Tower Pier - Check booking confirmation for departure point.